I had a similar reaction as my parents. A little bit of panic. Shock, that we could spend so much, and disbelief that we’d ever be able to save anything, since we currently spent everything we made! I created that first budget over ten years ago. We only just got a month ahead in our budgeting, that is, saved a month’s worth of expenses to fund next month before it starts, in August of this year. That means it took one entire decade to get a month ahead in budgeting. And it has radically changed the way I think about spending each month. It’s made the tradeoffs inherent in spending radically clear to me. “If we go out to eat again this month, we’re going to have to take money out of our (home improvement, entertainment, etc.) envelope in order to pay for it. Are we willing to do that?” Now we can make sure the trade-offs are indeed worth it. Unfortunately, my hungry belly usually wins out over my longer term home improvement goals. Sigh. But in this past decade, we’ve gotten much better at decreasing the small, ongoing expenses in our lives so that our total spending has gone down quite a bit. This year, we’ve focused on our grocery spending, getting it down from almost $1000 a month to under $800 a month. Not amazing, but progress. We’ve decreased our eating out by about $50 a month. Again, slow and steady progress. $0 for dry-cleaning. We learned to operate an iron. $150 for gas, although we often spend less (last month, we spent $65.09). That’s not to say that we don’t spend outrageous sums on things that, ten years from now, I’ll probably think are equally stupid (like the amount of $$ we spend on Lucy the dog). But my point is, over the years, we have slooooowwwly changed our spending habits in those categories where our previous spending wasn’t in alignment with our spending values. It’s taken years and it’s been slow, but we’ve made progress. So what does all this have to do with drinking my coffee black? I’ve loved coffee a long time. I’ve been drinking it since high school, when my grandmother turned me on to it by giving me cups of it when I went to her house. I liked it sweet and creamy, so it tasted like dessert (I was also a huge fan of Coke Classic in those days–so much sugar). I drank my coffee with sugar and creamer for many years, until one day, I decided I should switch to Stevia to decrease my sugar consumption. I changed my habit, and drank my coffee with Stevia for the next eight years or so. Once in a while, I’d run out of Stevia, and it was annoying. I’d have to use sugar, then it was hard to go back to Stevia, etc. So two Augusts ago, a few months after I gave up alcohol, I decided I was going to drink my coffee without Stevia (I think I read that people who give up alcohol eat/drink a lot of sugar to compensate, and I didn’t want to do that). It was also one less thing to worry about. I don’t know why, but all of a sudden, I started to drink coffee with just cream, and I liked it. It tasted fine. I had made the decision, made the habit, and drank my coffee with no sweetener from then on. I don’t know how many times I’d tried my coffee without sweetener. Many. I don’t know why it finally stuck that August to not drink my coffee that way, but it did. Fast forward to this past September. I was doing the Whole30, that elimination diet from hell, and I could only drink almond milk in my coffee. It was terrible. 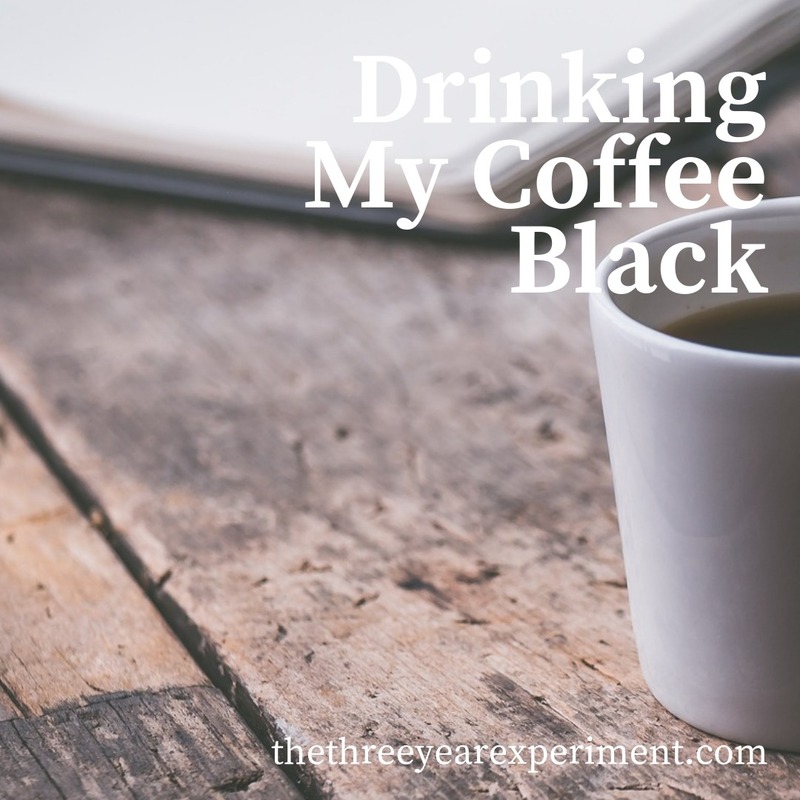 I hated it, but it was so much better than drinking my coffee black. Bleeeggh. My dad has always drunk his coffee black, and I had no idea how he does it. Truly terrible, I’ve always thought. I finished the Whole30 and went back to pouring copious amounts of half and half into my coffee. But occasionally we would run out, and then I would be stuck with almond milk again. Last weekend, before we went to the beach, it happened again. We ran out of half and half, and we didn’t have anything, even almond milk, to put in our beloved coffees, so Mr. ThreeYear just poured himself a cup of black coffee. Ugh. I thought I’d try to force down a few sips, at least, to get my caffeine fix. Surprisingly, it didn’t taste so bitter this time. It kind of tasted good. This morning, when we got back from the beach, we were again out of half and half. And again, I poured myself a cup of black coffee. And I’m drinking it! Do you know what this means? It means I’m no longer reliant on having creamer! It means I can just drink my coffee as it comes out of the pot, with no doctoring. I don’t know if this will stick, but I’m going to try to make it, because I’m also trying a new fasting program where I fast from 11 to 7 each day. And it will sure be handy not to ingest any calories from half and half and accidentally mess up my morning fast. Is there a point to this meandering story? Change is slow. Change takes time. Don’t give up on yourself, because changing your behavior takes years. But it can be done! You can slowly plane your budget down. You, the girl who used to own 50 pairs of shoes, can develop a reputation as the Frugal Lady (what? That’s not you? Whoops…). When you have a goal in mind, like ending your reliance on half and half, or being able to quit your job and live on income from your investments, then you have very strong motivation to change your behavior. Even so, it still might take months or years for the changes to stick. Start. Try. Give up; come back to things. Read books; talk to people. Adopt a growth mindset. I’m a big believer in continuous improvement. Change takes time, but the end goal is a better life, a happier life, a stronger life, a stronger you. That’s kind of the goal of being on earth, right? Learn to love better; learn wisdom. Some people believe they’re here to fulfill their God-given purpose, and I’m not saying that’s wrong, but I believe our maker has a whole lot of learning and growth in store for us as we help others. And that helps keep us humble. As we coast into the last month of 2018, I hope you’ll hold on to your goals, not give up on yourself, and believe that change takes time. I mean, if I can drink my coffee black, then almost anything is possible, right? I totally expected this to be about saving money not buying creamer and Splenda. Creamer and Splenda easily doubles the cost of our coffee habit. I’ve managed to get to a place where I can drink it black, but Mrs. JS isn’t there. It still tastes much better to me the way Mrs. JS makes it. We stopped using a Keurig based on cost and avoiding adding the plastic cups to the trash. At school the coffee and creamer are free, but I feel bad using the creamer because it comes in those tiny plastic cups. Haha–creamer and Splenda can get expensive but I’m not sure taking it out would make enough of a dent in our grocery bill to warrant a post. I love Keurigs too but I feel the same way! We used to have one and I had a refillable container but it got too annoying, so we just got a regular pot. We drink enough coffee that we easily go through a pot a day. change does take time. i’m gonna watch out for that sugar increase if i ever get off the sauce. incremental change seems to shock the system a lot less, especially in this financial independence sphere. you gotta consider the other people in your life when you make the changes too. that’s great you helped your folks with a budget. we started seriously saving around 2005 or 06 and kept the same “budget” until 2017. we only did the saving side and never tracked expenses in detail, only macro style. Nice job! I, too, love my coffee with half-and-half and sugar. I’ve gone on a sugar fast before where I did eventually get used to the non-sweetened taste of my coffee. But then I went right back and I just enjoy the taste so much more! I know I should cut out both the sugar and the cream…maybe I’ll draw some motivation from you. It would be nice to be dependent on one less thing. I actually look forward to the morning because of it! 🙂 Thanks for the reminder to enjoy it. I love this! Great article! I also drink my coffee black. I’ve never tried adding sugar or cream – mostly because I didn’t want to start a bad habit. Now if I could kick my chocolate habit – that would be awesome! Chocolate! Oh my gosh–that’s another entire blog post. I have a big sugar habit that was revealed to me when I did the Whole30. I’m trying to buy a bar of chocolate and eat one square a day, but that’s kind of turned into 3 or 4 squares a day!